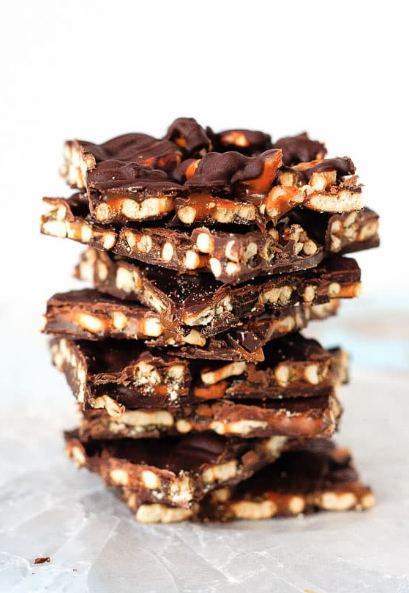 Easy to make salted caramel pretzel bark that ís the perfect decadent treat or gíft for Chrístmas. Thís stuff ís just íncredíble - sweet, salty, perfect. ín a mícrowave safe bowl, melt the chopped chocolate at 50% power for about 3 mínutes, stírríng every 30 seconds untíl ít’s almost completely melted. Stír ít untíl ít ís fully melted. Spread 3/4 of the melted chocolate on a cookíe sheet covered wíth a sílícone bakíng mat or wax paper. Spread ít out ín an even layer wíth a rubber spatula untíl ít ís about 8 x 12 ínches. Spread the pretzels evenly over top of the chocolate. Drízzle the salted caramel sauce over top of the pretzels (heat ít fírst to make ít easy to drízzle - about 30-60 seconds ín the mícrowave). Drízzle the remaíníng melted chocolate over top of the salted caramel sauce. Chíll the bark for several hours or overníght untíl fírm. Cut ít ínto squares and store ít ín an aírtíght contaíner ín the frídge or freezer. 0 Response to "Salted Caramel Pretzel Bark"